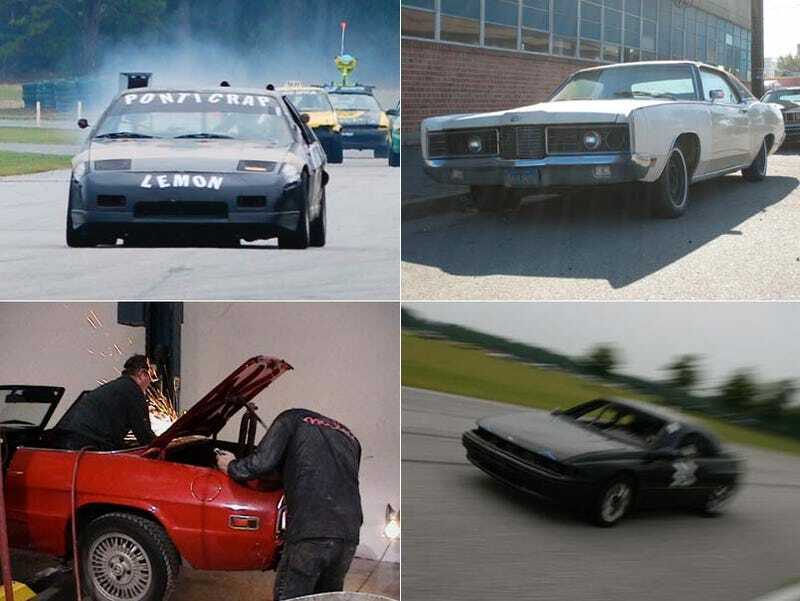 Guess The 24 Hours Of LeMons South Laps, Win Fabulous Prizes! Before the Gator-O-Rama 24 Hours Of LeMons race, readers guessed how many laps they thought a couple of Index Of Effluency contenders might complete. Syrax takes that one, with an amazingly prescient guess. Guess The 24 Hours Of LeMons Lap Totals, Win Fabulous Prizes: Opel GT or MGB-GT? Syrax guessed 195 laps for the Team Opular Dependence Israel Opel GT, and 260 laps for the Frogmasters MGB-GT. When the race was over, the Opel had finished 180 laps and the MG did 260, giving Syrax a total error of just 15 laps. For that achievement, LeMons HQ in lovely Emeryville, California, has shipped out a fine collection of LeMons apparel (shown in the photo above) to Syrax. We're sure he'll be knockin' 'em dead with that LeMons LifestyleWear™ in his hometown of São Paulo, Brazil. And, hey, it's that time once again – guess the laps, win fabulous prizes! To give you some guidelines for probable lap totals at the LeMons South Spring race, the winner of the race last August notched 512 laps, and most of the top finishers racked up something around 500 laps. Speaking of "racking up", our first contestant in the You Guess The Laps contest is the Subaru SVX of Team Living Waters Church of Subaru; Beauty of All Wheel Drive Tent Revival. Last time around, this car managed a total of six laps, thanks to a broken steering rack and other impossible-to-fix problems, with the team taking the I Got Screwed trophy after wrenching furiously for the entire weekend to even do as well as they did. Now, everyone knows an SVX should totally dominate on the racetrack, so maybe your best bet is to opt for 550 laps this time. No, 600! My own guess will be a little more conservative; I think it will manage 257 laps before breaking some part you can't find in South Carolina. Then there's HEAVY METAL, a team whose members keep the pedal to the metal and the CAPS LOCK key pressed down just as hard. All we know about this team is that their car is a '72 Ford LTD… but, really, what else needs to be said? I'm using the shots of a DOTS 1970 LTD to represent what I'm sure will be a Legend In Its Own Time LeMons machine. The question for you is: how many laps do you think it will do? Like most big ol' Detroit LeMons racers, an LTD ought to be reasonably reliable on the track, but anything can happen out there! My guess: 360 laps. We love Alfa Romeos at the 24 Hours Of LeMons; in fact, three of the top ten finishers in the New England LeMons were Alfas. Those were bulletproof Milanos (bet you've never seen those two words together! ), however, and Dog Ciao Racing is running a '74 Spider. Sure, a Spider should annihilate the field on a race track… though for some reason the Ecurie Ecrappe car has never managed to place higher than 18th, despite being piloted by an all-ringer team of ace drivers. Yes, reliability issues and Alfa Romeos go together like the lira and inflation, but maybe this Spider will be different. My prediction: 146 very quick laps, achieved in several sessions punctuated by not-so-quick engine rebuilds. Last year, Team Ponticrap (We Are Driving Excrement) had a rough time at the hands of race officials, first getting sweated extra-hard by those mean ol' judges, then finally getting put on the trailer by the Chief Perp after spinning out one too many times on the track. The car actually held together pretty well and was quite fast, so if the team can keep their Fiero's plastic nose pointed the right direction… hey, maybe they can actually win this thing! I think they'll do pretty well this time: 498 laps. OK, you know the deal: put your guesses in a comment, and the fabulous prizes will be heading the winner's way many weeks soon after the race. While you're here, you might as well check out the complete entry list, which LeMons Supreme Court Justice Lieberman scooped me on, from his new venue at Supreme Court Justice Zerin Dube's Speed:Sport:Life. Yes, that sure is a lot of BMWs… and I'm already feeling skeptical about the legitimacy of any E30 coming my way during a BS Inspection! And those of you wondering why that '78 Kadett wasn't on the Guess The Laps list should look at this serious race car, which avoided massive lap penalties only because it's a Buick-badged Opel with an Isuzu engine.